RSU 18 wanted an online presence that accurately reflected the excellent work being done in its educational communities. 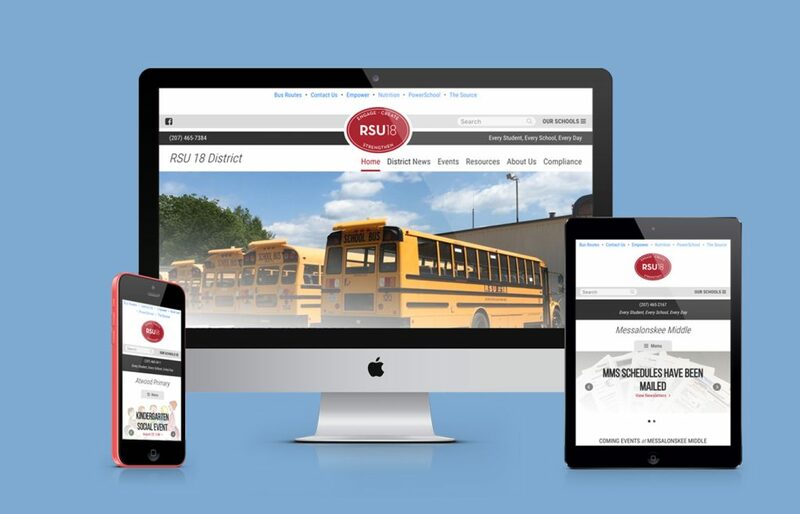 RainStorm helped RSU 18 move to the WordPress content management system from an outdated proprietary software, which enabled RSU 18 to better utilize new technology and showcase its learning environment. RainStorm has been working for the past few years on a special website hybrid that brings K-12 educational organizations the best of the WordPress content management system and the power of school-focused tools that had been found before only in proprietary software. We call this combined system SchoolFlex — and RSU 18 is the latest Maine school system (China, Belgrade, Oakland, Rome, and Sidney) to launch a website using our SchoolFlex system! The multisite setup of SchoolFlex enables the administrators of the K-12 school district to control and update each of the school websites from one place. Network-wide search offers keyword-based results pulled from every site in the network. If you’d like information on our SchoolFlex system, please contact us! We’d love to work with your K-12 organization! Company news, industry analysis, and advice from RainStorm. Subscribe to The Almanac, our quarterly RainStorm newsletter. We would love to talk to you about your next website — call or message us today to see how we can help you. © Copyright 1999-2019 RainStorm, LLC.